with our ES $1000.00 top prize! Don’t forget our Juried Arts Gallery contest with $2000.00 in prizes! Apply by clicking here! 1. Your selected canvas/s must be with you when you sign into the Plein Air Art Contest Booth adjacent to the Juried Arts Gallery at Riverside Park. The size must not be larger than 18×24 and wired to hang. 2. At the Plein Air Art Contest Booth adjacent to the Juried Arts Gallery in Riverside Park on Riverside Drive, Easton have your canvas/s stamped for entry into the contest. You must provide all materials, canvas, board, paint, brushes, etc. Find an inspired spot at the festival for your art en Plein Air (in the open air). A map of the area to paint in will be supplied. Art must be wired to hang by the artist or not admitted to the contest. 3. You must turn in your art and sign out by 4:00 pm Saturday if art is completed or not to remain in the contest. Feel free to drop your piece/s at the booth before 4:00 pm if you are done for the day.You may collect on Sunday 10:00 am to continue or start another piece if you choose. You may submit up to two pieces into the contest. Last drop off for judging 2:00 pm Sunday the 16th. $40/$50 per submission fee. ONLY CASH will be accepted on the weekend for any additional work. Return your piece/s on Sunday for judging by 3 prominent art experts by 2 pm. No exception. 5. Artists agree to allow Riverside Festival of the Arts to use images of their art being created at any RFA event for marketing purposes only, unless otherwise notified in writing. Artists may be asked to show their work and participate in a plein air exhibition if they become available. email eastonriverside@gmail.com for more info! Plein Air Art paintings from a few of the last annual contests are now featured for sale, and 30% of those proceeds go to the non-profit 2017 arts festival & the Pomfret Club at 33 s. 4th st. in Easton. Now – thru March 31. Stop by 11-4, Tues-Fri. This 2016 plein air art contest exhibition was also featured at the Easton Hospital Gallery @ the State Theatre this winter. Here’s a peek at some of the the 2016 plein air art. Who knows Diddley-Squat, about en plein air? Chauncey Howell, that’s who. 2016: What a wonderful 7th annual plein air art contest! $2000 in top prizes this year, to celebrate Riverside’s 20th event! $1000 to the 1st prize in 2016 went to * Michael Schade! * 2nd place went to Lauren Kindle , 3rd to Lehigh student Amelia Galgon with the honorable mention to Catherine Whitehead : CONGRATS ALL! and thanks everyone for coming out to paint. BEAUTIFUL WORKS. Easton’s Michael Schade took first place! Lehigh Student Amelia Galgon took third place. Catherine Whitehead takes an honorable mention. 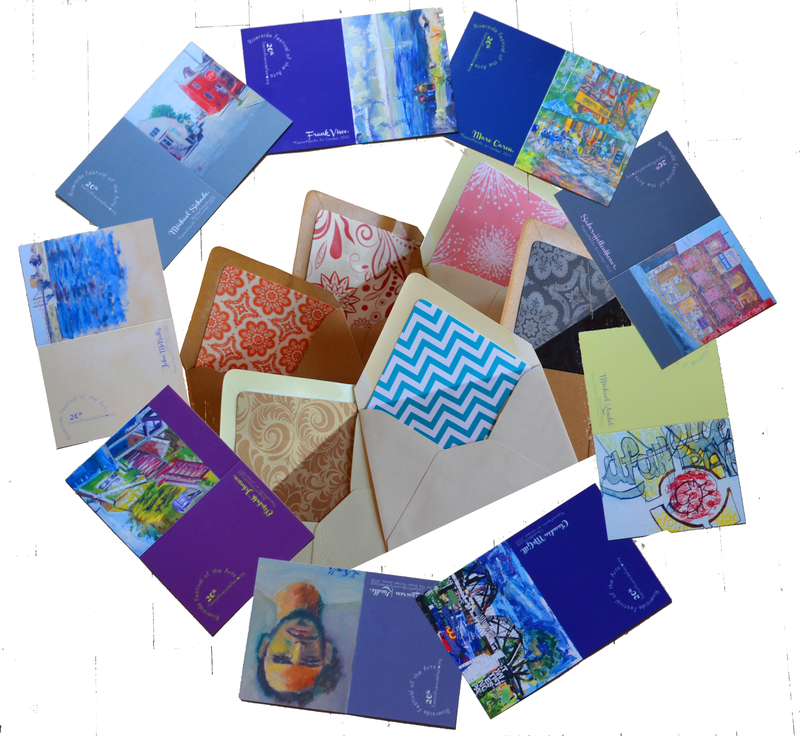 Fundraiser: purchase a set of our gorgeous 9-notecard box-set, complete with beautiful lined envelopes for $20.00. They are 9 paintings from over the last 7 years of the contests and ALL PROCEED$ go directly to the next Riverside Festival plein air art contest! Pattern-lined envelopes; lovely. Ellen at this email to order a set. Artists let us know if you have more ideas to improve the contests going forward. In 2017 we may do a ‘capture a moment’ theme. The plein air art continues to get better and better with every year. Follow @EastonRiverside #EastonPleinAir. En plein air simply means “in the open air”. The challenge for these artists is the shifting light. Secure your spot and register now! BYO supplies and pre-wire your canvases for the final presentation of paintings, for judging. We hope to organize another plein air art exhibition after the event with a local gallery or two, for opportunities to sell your work. Thank you Sponsors… we are now accepting 2017 Sponsors! If you want to sponsor this contest /any specific element of the festival you may designate that. 9-notecard set, with beautiful lined envelopes: $20.00 * all proceeds go to the plein air art contest send an email if you want to buy a set! 1. Your selected canvas/s must be with you when you sign into the Plein Air Art Contest Booth adjacent to the Juried Arts Gallery at Riverside Park. The size must not be larger than 18x24 and wired to hang. 3. You must turn in your art and sign out by 5 pm Saturday if art is completed or not to remain in the contest. You may collect on Sunday to continue or start another piece if you choose. You may submit up to two pieces into the contest maximum. Feel free to drop your piece at the booth before 5 pm if you are done for the day on Saturday for the overnight. 5. Artists agree to allow Riverside Festival of the Arts to use images of their art pieces being created and final creation during the event/s for marketing purposes only unless otherwise notified in writing to RFA. Artists may be asked to show their work and participate in a plein air exhibition if they become available. Click SUBMIT to complete your application. You will be taken to PayPal to pay online.